RevK®'s rants: Something is wrong on the Internet? 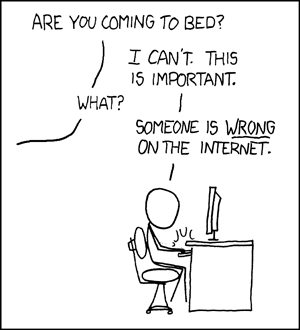 It never feels like the day has properly started when Randall Munroe is late with his XKCD post. I suspect millions of people around the globe are all slightly concerned that he may be unwell. Just five minutes ago I had to ask the person behind me if it actually was Friday or if I was a day out because of this. I always worry that his significant other has taken a turn for the worse.